In a small frying pan, heat bacon fat over medium heat until melted. Ad breadcrumbs, stir to coat with the fat and cook, stirring frequently, until crumbs are golden brown, about 5 to 7 minutes. Season with salt and pepper and set aside. Pat chops dry with paper towels and season liberally with salt. In a medium skillet, heat oil over medium-high heat until hot (it should shimmer). 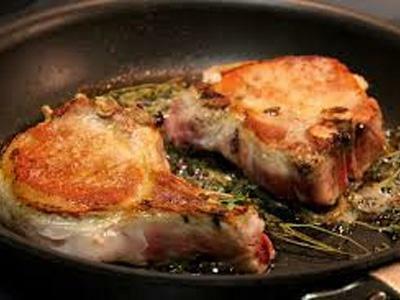 Place the pork chops in the pan spaced apart a bit. Add the butter and scatter the thyme sprigs in the pan. Cook chops until well browned, about 6 minutes, then flip them over and continue cooking until lightly browned and cooked through to 140 F (medium), about 3 to 5 minutes longer (mine took a bit longer to reach temperature, but I also cooked through over slightly lower heat). Transfer pork to serving platter, spoon some of the butter from the pan over the chops and allow them to cool for about 5 minutes. Just before serving, squeeze lemon juice over the chops and top with a handful of the breadcrumbs.